The qualifications required to hold the office of U.S. Senator or Representative to Congress are established and set out within the U.S. Constitution. These constitutional qualifications are the exclusive qualifications for congressional office, and may not be changed or added to by the Congress, nor may these qualifications be added to or changed unilaterally by a state. The duties carried out by a Member of Congress are understood to include representation, legislation, and constituent service and education, as well as political and electoral activities. The expectations and duties of a Member of Congress are extensive, encompassing several roles that could be full-time jobs by themselves. 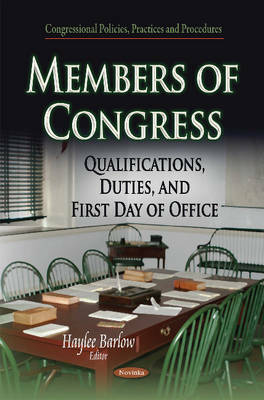 This book discusses in further detail the qualifications and duties of a Member of Congress.